Located just north of Springdale, UT lies a unique piece of nature that stretches 229-square-miles known as Zion National Park. Zion is a gorgeous bit of American nature, featuring Zion Canyon which was created by the Virgin River cutting through colorful Navajo Sandstone. Unlike most canyons and other parks of its type, Zion’s natural habitat is a diverse one that features near 400 different species of animal, including 289 different species of bird. This living diversity makes Zion a unique experience and ensures that a return visit is well worth the trip. Though it provides access to the Grand Canyon’s north rim, there is plenty about Zion National Park that makes it a tourist location all its own. Outside of its bountiful plant and animal life, Zion offers several touristy attractions that give travelers the chance to get up close to wildlife that may not be indigenous to where they’re from. For those that enjoy hiking, Zion’s trail system offers a variety of levels and lengths, with trails to Angel’s Landing clocking in at 4 hours and Weeping Rock only taking about a half hour. As with any means of hiking, guests are encouraged to not do anything beyond their means. No matter which trail you feel comfortable with, though, you’re still going to get a great experience. One of the more popular hiking trips is up through The Narrows from the Temple of Sinawava. A trek through the entirety of the narrows via Chamberlain’s Ranch will take an experienced hiker 12 hours, and it’s quite the strenuous walk. Less experienced walkers may want to enter the narrows via Orderville Canyon for a shorter and less taxing hike. Hiking not your thing? Hop on the back of a steed through a guided horseback tour, which will give you a better opportunity to get a good look at what Zion has to offer. If you’re looking for even more excitement that horseback riding and hiking can’t give you, than you may want to take part in some of Zion’s popular rock climbing. Several walls, including Touchstone, Moonlight Buttress, and Spaceshot, offer short climbs that are good for the amateur climber and the professional simply looking to get a little climbing time in. Though Zion can very easily be a day trip, there is plenty of lodging available if you’d like to extend your stay. Located halfway through Zion Canyon is Zion Lodge, a year round lodging facility that offers motel-styled rooming and more rustic cabins. Complete with a gift shop, restaurant, and café, Zion Lodge is the perfect place to call it a night. If you’re into roughing it, Zion Lodge provides three separate campgrounds that accommodate those looking to get closer to nature. No matter what brings you to Zion National Park, be it the need to get closer to nature or the experience of roughing it outdoors, you’re going to find exactly what you’re looking for. Put on your comfortable shoes and clothing. You are about to embark on a Mount Zion adventure tour. 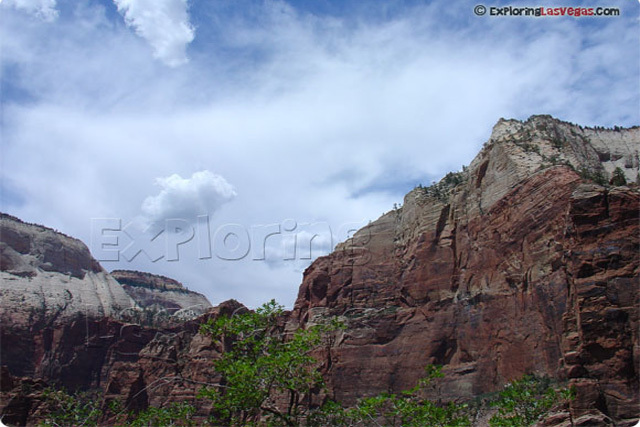 Visitors to Las Vegas will enjoy the majestic beauty of Zion National Park when they schedule a Mount Zion tour. You will be picked up at your hotel by our tour jeep around 7:45 a.m. when you will be whisked away for a 9-10 hour trip exploring Zion National Park and everything the park has to offer. The beautiful landscape is complemented by the winding, Virgin River. This river helped to shape the land in and around the park over the centuries in which its waters have flown. The most amazing thing the river has created is Zion Canyon. For years, the river's waters have chiseled away and slowly pared the land to form the canyon and the land that surrounds it. You will see the work of nature as you explore the mesas, sharp towers, high plateaus, and the sandstone walls. 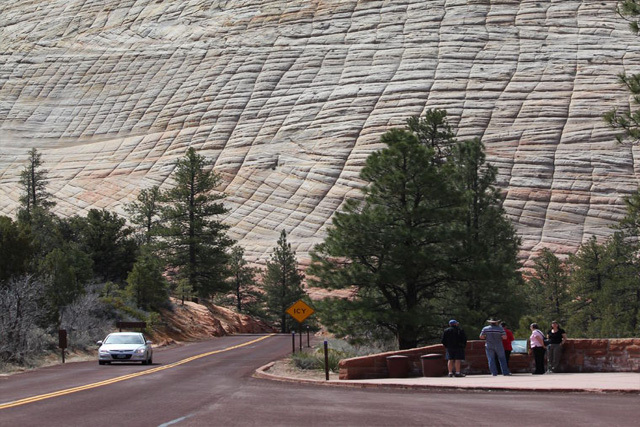 In fact, Zion National Park is home to the world's tallest, known sandstone wall! The Park is also home to many of the most beautiful desert landscapes in the United States including the Court of Patriarchs, Great White Throne, Temple of Sinawava, Weeping Rock, and Angel's Landing.